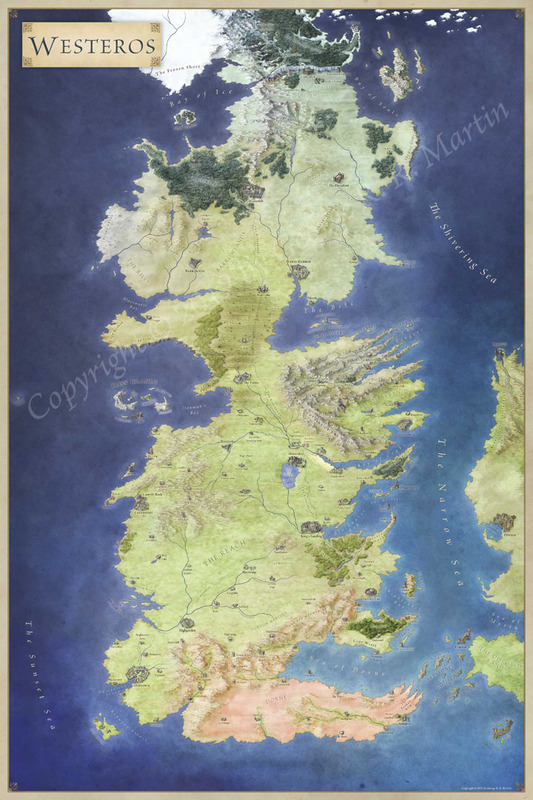 So here’s the Lands Beyond the Wall. This is one of my favourites (and the one hanging on the wall at home). One comment that comes up a lot is that it’s too green. 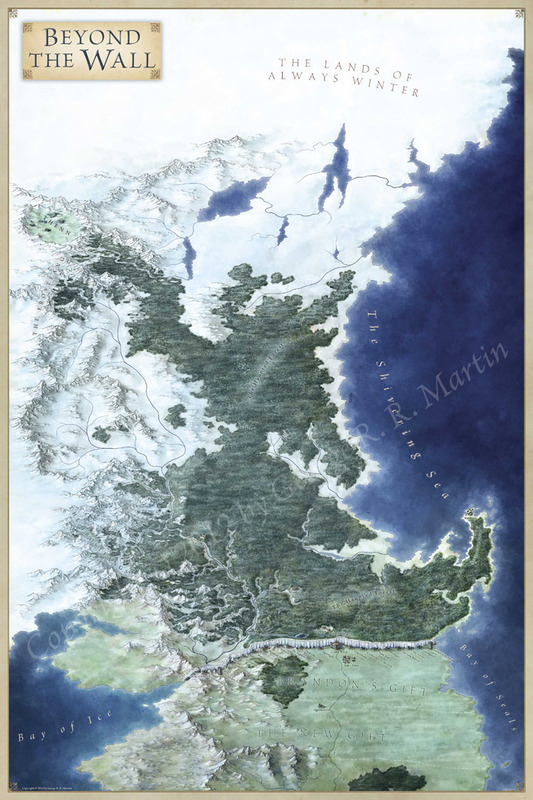 Note that north of the wall isn’t actually snow-bound all the time. As the Nights Watch travel to the Fist of the First Men, the first flakes of snow begin to fall. In the process of the creation of this map, the snow line was gradually pushed north towards the Skirling Pass. There’s a lot of forest in this map. The Haunted Forest is almost a character in its own right in the novels, looming dark and forbidding, and hiding a plethora of faceless evil. It was great to get the chance to create a proper threshold at the Wall between the (mostly unforested) lands of the Seven Kingdoms and the brooding leagues of forest to the north. But this meant working on detailing a lot of forest. My favourite parts are where the forest meets the mountains – where it looks almost like it flows up the sides into the valleys like a breaking wave. This helps to sell the mountains – we’ve all seen the real tree line on mountain ranges – and the edge of the forest can help the details of the mountains read well even at distance. Here’s a shot of the forest a 3x the print resolution. This should give a sense of the suggested detail in the forest, rather than painting every single tree on 6 square feet of map! 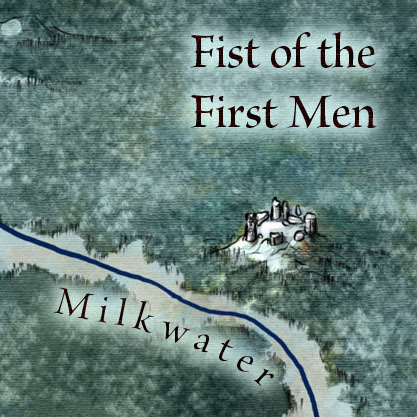 The Fist of the First Men obviously receives more care and attention, as the site of a major show-down in the novels. 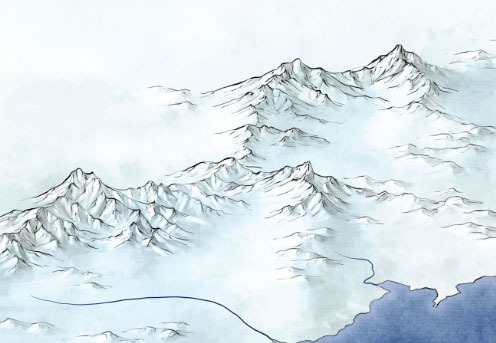 The other main feature of this map are, of course, the mountains! Normally, my mountain ranges are grassy at the base to stone at the top, but here they are snowbound – at least in the Lands of Always Winter. This is a tricky one, as you want to suggest height, majesty and formidable scope, but if you darken the shadows too much they just go back to looking like stone. I walked a middle ground with these, allowing the line art to carry the mountains in the far north, and going back my standard colour palette for the snow-less mountains in the south. 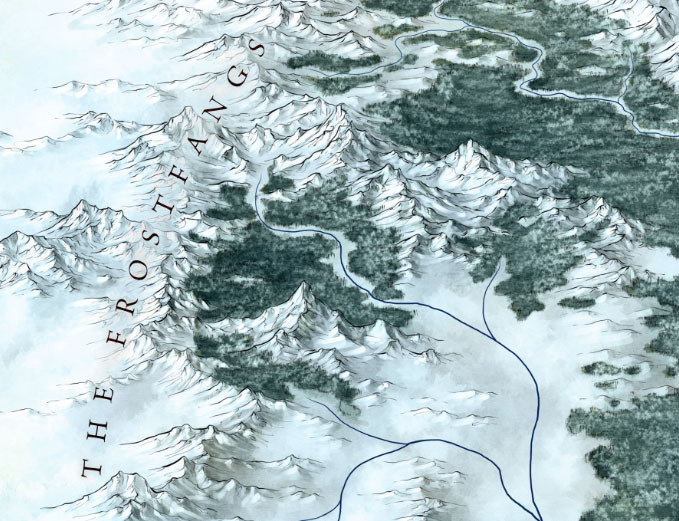 Talking of the southern mountains, here’s my favourite little detail in this map – again at 3x print resolution. 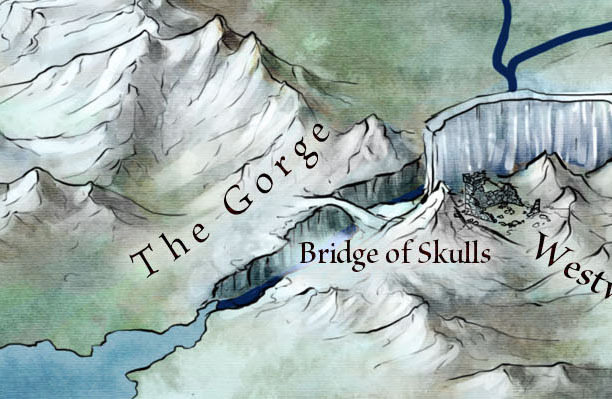 The Bridge of Skulls hasn’t shown up in person yet, and I admit I’d not paid it much attention, but the existence of a bridge that circumvents the wall must be a major feature in the defence of the North. I’m looking forward to seeing whether we end up re-visiting the Bridge of Skulls down the line in the novels. If you’d like this map at full resolution, you can get the physical poster (and all 11 others) over at Amazon, for $2 a poster. It definitely should be in there. Each map has a different title on it – and you should have 12 posters in total. The thumbnails are on the back of the box! That’s pretty terrible. Can you take it back to the store and get a replacement?